Used the jack on my 2 cars. Easily lifted the cars and works as it''s supposed to. Good item. Feels very well built and solid. A very easy to use trolley jack,that is made easier by means of the central lifting handle. It lifts my small van quickly. 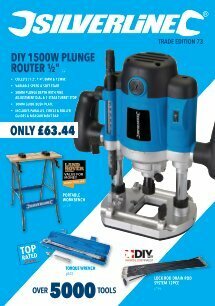 A well made tool at a very good price,well done!. It is heavy and is made out of thick steel, all the components such as the wheels are robust and it should easily last a lifetime, which is how long it is guaranteed for. It is nicely packaged and labelled by Silverline and consistent with this it works perfectly straight out of the box. The labels pull off easily. The paint is matt so it is not shiny, but the dirt still wipes off easily. Although a bit intimidating at first, it is a pleasure to use and quickly becomes a trusted partner. There is nothing fussy about it and it inspires confidence. Superb little jack,plenty of power, well built at a superb low price. I would recommend this Jack to anyone. I’ve gone through few trolley jacks in the past few years usin them for work on a regular basis, this 2 Tonne Silverline jack is simply a fantastic value for money and out performs many more expensive jacks in the market. Doubled by the full lifetime warranty!!! What else do you need?! I highly recommend this product and will be purchasing more myself. This is an exceptionally great quality hydraulic jack. I''ve even had friends ask me where to get this one! I would definitely recommend. This is a long time a looked for a tool like that to maintain my cars. Easy use, not too heavy et can store it in car. Great tool. After struggling with my old car jack and getting it stuck under the car,I decided to get a trolley jack,after looking on line I plummed for the Silverline trolley jack,it looked more robust than other jacks and was less expensive too. I cannot be more pleased with this product,it is the best £20 I have spent in ages,it saved me time and stress,thank you Silverline tools! Needed a second trolley jack to work on my granddaughters car so thought I would give this a try. This jack works a treat and is quite low to get under even a small Corsa and the lift and lowering was very positive and having the wheels allowed the jack to stay central under the lifting points whilst being used. Really good buy, excellent value for money. Easy to use. Simple and effective, bought it with a pair of axle stands too. Had a scissor jack collapse whilst lifting my car so I bought these to make life a little safer. Good quality item with a lifetime warranty, what''s not to like. Good item, does what is says etc... But a very misleading Advert on the Silverline website as you see a Hard Carry Case. But this is not included in the sale. After contacting Silverline Customer Services - Not Interested, there goes another customer to a new seller !! This jack although reasonably compact and lightweight, has no problems lifting my car and unlike my old jack all 4 wheels ( the jacks! ) stay firmly planted on the ground. Overall this seems a good solid tool that will give good service over the years. Good product, well made. But you do not get a plastic carry case? Good quality product, but did not come with a plastic carry case? This Jack is really impressive. I bought it so that if I have a puncture in my touring caravan tyre I stand a chance of being able to change it. On receiving it I used it to lift my caravan and turn the tyres so they didn''''t stand all winter in one place. It completed the task really well, I was so pleased and impressed! The only thing that I was slightly disappointed with was we didn''''t get a box to keep it in, but that the only negative I have. I will definitely make sure I always have this Jack in future. Brilliant! Purchased the Silverline 2 Tonne trolley Jack after my previous trolley jack packed in. I was pleasantly surprised at the cost of my new jack and the fact in came in a carry case. Can''''t fault this jack at all and it does just what''''s expected of it. Very happy indeed. What a time saver! No more messing about with slow scissor jacks. The price was keen and the box a bonus. I bought this to replace an old Halfords trolley jack that was leaking - at the price this made it not worth repairing the old one. This is a well made jack - it has a short throw so lifting a heavy car is not as easy as using a jack with a longer throw, but it does it with ease. If I had any complaints, the plastic handle slips of the jack handle easily and I''''d say the case is made of very poor plastic and mine cracked within a day or using it. That said it hasn''''t cracked further and it keeps it all nice and neat. Overall - pretty happy with it and would recommend. Small and manouverable, bought this as a back up to my bigger trolley jack that is a bit of a handful to carry around. Use this for quick jobs on the front drive and take it with me if I''m helping out mates. Case didn''t last long and I squeezed the handle flat to stop the hand grip coming off, but good value and useful tool. this is one of the best trolley jacks I have used. well worth the money. I have used this jack about six times and every time it has worked perfectly, a very good value for money jack. This Silverline Hydraulic Trolley Jack is guaranteed for a period of 30 days from date of purchase against a fault developing in either the materials or the workmanship during manufacture. You can register for your Lifetime guarantee by registering your product online. Any faulty goods will be repaired or replaced free of charge.